Baguio City — The beat and rhythm of the Sinulog in Cebu City resonated even in a cold mountain city located some 1,900 kilometers from the center of the festivities. This as seminarians and devotees carrying with them different sizes and versions of the Sto. Niño statue flocked to the chapel of Casiciaco Recoletos Seminary here last Sunday — January 20, 2019 — to take part in the observance of the feast of the Holy Child Jesus. Fr. Amparado, who is also the seminary rector, blessed the little children present and the different Sto. Niño statues of the mass goers in a special rite during the mass. After the final blessing, the rector held the chapel’s enthroned Sto. 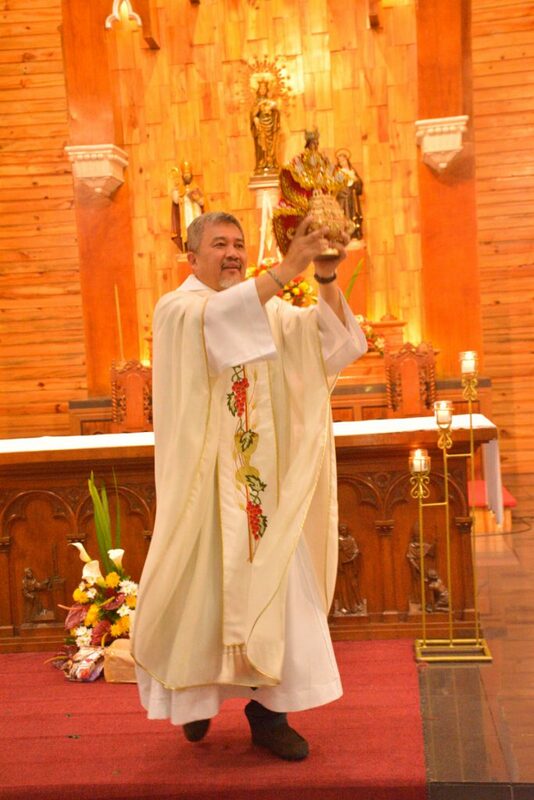 Niño icon in both hands and danced to the popular beat of the Sinulog in front of the altar, a Sinulog tradition observed by presiding priests in Cebu. According to the journal entry of Pigaffeta, the official chronicler in Ferdinand Magellan’s expedition, Queen Juana of Cebu received as gift the image of the Sto. Niño after she — with husband Rajah Humabon and some 800 natives — was baptized by Fr. Pedro Valderrama in 1521. It was Pigafetta himself who presented her the sacred image, now considered the oldest Catholic icon in the country. Some 40 years later in 1565, a sailor in Miguel Lopez de Legaspi’s fleet found in one of the destroyed houses of a village in Cebu the same unscathed image of the Sto. Niño which had been given to Queen Juana. The image has since been entrusted to the care of the Augustinian Fathers and housed in the Basilica Minore del Sto. Niño de Cebu. He exhorted the faithful to imitate the virtues present in the Sto. Niño — and in every child — namely: simplicity, humility, innocence, docility and trustfulness. “God took the initiative to be near us so He could bring us back into his fold, so we’d do well to follow the examples of the Sto. Niño,” he added. The neophyte seminarians, before the 7 a.m. mass, started the festive mood by dancing to the beat of the Sinulog inside the chapel. With the mass goers already seated, they performed their dance routine along the aisles and gave the audience a close-up feel of what is happening in Cebu’s streets at those very moments. After the mass, the Grade 12 seminarians gave a more elaborate performance of the Sinulog at the seminary façade, with a live band playing Sinulog beat and rhythm. The mass goers were visibly pleased with the performances, judging by their reactions. “This makes me feel at least close to home in this special feast of the Sto. Niño,” said Bantayan, Cebu-native Br. Kline Kysser Asentista who was one of the organizers of the activity. He was also the Sto. Niño bearer for the Grade 12 dancers.